RealElvish.net > Blog > Realelvish Academy News > 400 Books Sold! Lulu Print Books 15% Off to Celebrate! May 23, 2018 Fiona J.
I’m so excited guys! 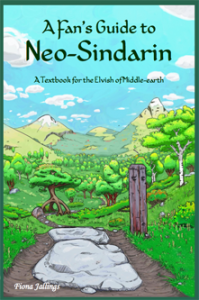 I did the first count up in a while of all the copies of A Fan’s Guide to Neo-Sindarin that I’ve sold, and discovered that I’d just sold the 400th book! This is something to celebrate, so for the rest of May and June, the Lulu paperback and hardcover are 15% off! In other news, Miscon is this weekend. See you there! Hi! My name is Stephanie and I was just directed here by another site. I think it’s really awesome that you’re so passionate about elvish, and I love that you have a book guide to elvish which I’m definitely going to check out! I have a degree in English literature, and I’ve taken both (basic) French and Latin, but I’m not very good with linguistics XD I just had a question which no one online seems to have an answer to. There’s a song from The Desolation of Smaug called Tauriel and Kili, and the lyrics posted online are not accurate. All of it is accurate up until the last verse. The lyrics are: Have ephadron theri thaur (elvish,i go walking beyond the forest) imri zaizi (dwarvish take me with you) am na dhu ias fir i ambar (where the world falls away)…and then the last line which is completely different in the song from every printed version except the piano music “Alt me lethal nin yu nin” which has a general translation of ” I love you” from what I’ve gathered through my own research. I want to get this tattooed, but I want to know what the exact translation is. Do you have any idea? Thank you so much, and I’m definitely going to follow your page!!!! I would love to get a copy of this book. I’ve used your material for years and would like to start up again.